An HHR viewer sent this photo of the earlier location of Big Winds (circa 1989-1990). You may recall this building as the early location of Tum-a-lum Lumber, or Promotion Wetsuits, or Bart's Best Bets, or perhaps Panzanella Bakery, or Knead Bakery, or maybe it's current life as the catering headquarters for Solstice Pizza. Any other recollections of tenants of this building? Note the diagonal parking. This was also before the Diamond Fruit building across Cascade Avenue burned down in the mid-1990s. I remember Tum-a-lum. I don't remember the fire. Actually that building across Cascade was torn down (by Joel Bielhartz) during the Columbia St phase of downtown Urban Renewal. The cold storage building that burned was the next block west. I'm not sure the Big Winds building was ever Promotion unless it was after Big Winds moved in 2000? 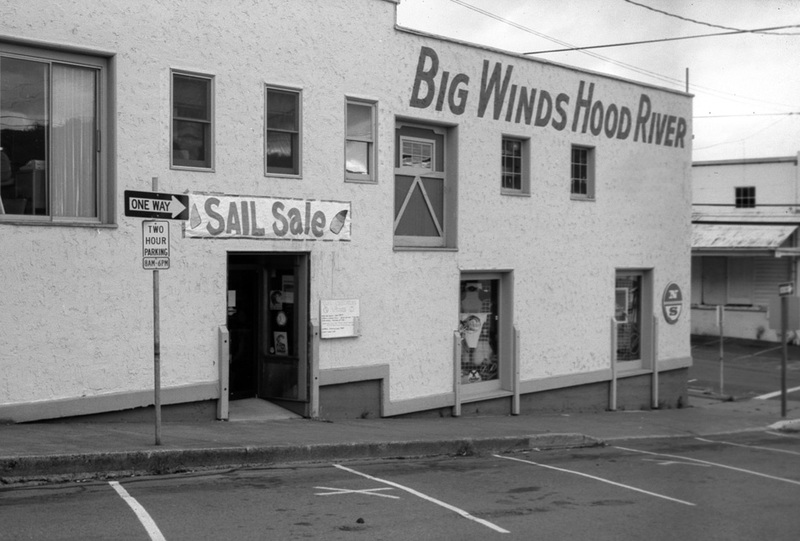 Dana Love moved Promotion here in 86 or 87 and shared the old building where Hood River Cinemas is now with Rushwind sails until he built the new brick building on the corner. I think Promotion moved in there after Big Winds left, and stayed there until their new building was complete a few years later. Could be wrong. We'll have to check with them. Yes I remember when that AGA warehouse burned. If I recall my Dad, who took fruit there on occasion referred to it as "the Cascade House. What a difference to have all those ugly overhead lines buried! I know it's not cheap, but what a difference it makes for a community--especially one like Hood River, with such exceptional views.